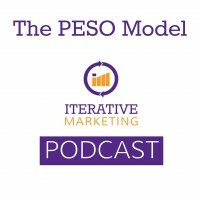 The PESO Model stemmed from a revolution in the public relations community and is often underused by marketing departments. The acronym stands for Paid, Earned, Shared and Owned components. The model can be helpful when trying to organize and recognize promotional opportunities, which includes segmenting all of the marketing channels into discrete groups. It allows marketers to look at marketing efforts through four lenses to see if there are any opportunities to integrate additional channels into a new or existing program. In 2008, marketing communications had 2 and a half houses. Public Relations handled earned media, such as press mentions and publicity for which no money was exchanged. Publishers kept their houses separate and a lot of effort went into preserving the delineation. Around 2008, PR started to drastically change. Blogging and the internet forced PR to recognize the Owned component of the marketing landscape as a first-class citizen. Social media and blogging gave consumers a voice with the same reach as publishers, creating another channel that wasn’t paid, earned or owned. The walls between ad sales and editorial started to fall as publishers grasped for revenue. Publications folded. Journalists were laid off or move from staff to freelance, thereby breaking down the established PR relationships. Peers gained authority as review sites and social media allowed anyone to crowdsource. Public Relations had a bit of an identity crisis as they tried to integrate social media into their practices, only to have algorithms turn social into a paid channel under their feet. 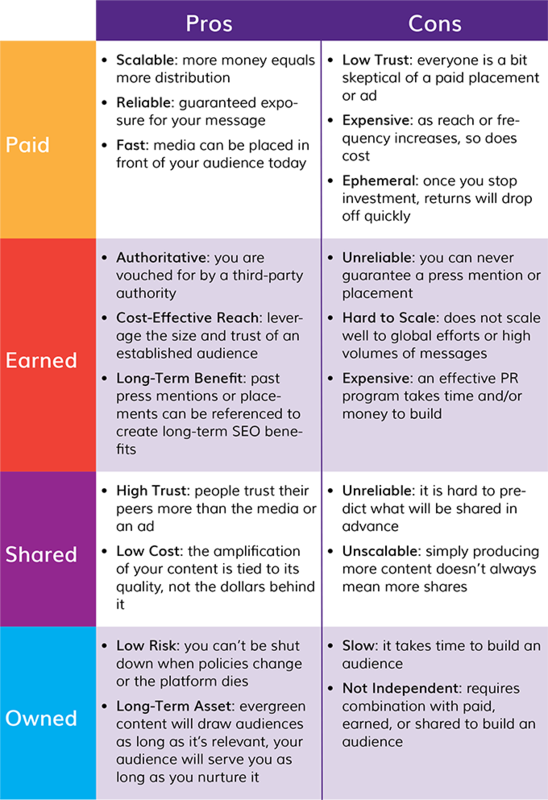 PR needed a new model to provide more than just the earned media channel. 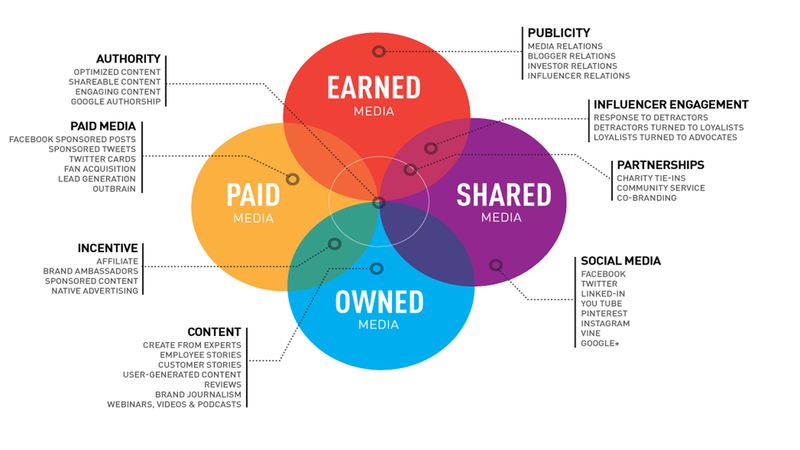 In 2014, Gini Dietrich introduced the PESO model, giving a name and infographic for the PR industry to rally around. Now, most modern PR firms work within at least three, if not all four areas to get results for clients. The model is a means of segmenting all of the marketing channels into discrete groups. It allows marketers to look through any of four lenses to see if there are opportunities to integrate additional channels. It also provides a means of making sense of and organizing existing resources. Paid: When money is exchanged for distribution, whether an ad or content. Example: Online advertising to get the word out about the program. This might include banner ads, a paid video promotion and some Outbrain/Taboola placements of some blog posts sharing the “craze” on various news sites. Pros: Scalable, reliable and fast. Cons: Low trust, expensive and ephemeral. Earned: Trading valuable content for an established authority’s audience. Example: Press relations, hoping a story on the campaign would land on everything from daytime TV to the local paper, as well as the mommy blogger contingent. Pros: Authoritative, cost-effective reach and long-term benefit. Cons: Unreliable, hard to scale and expensive. Shared: Amplifying content through your own audience. Example: Call to action that, to complete the challenge, you must share a video of yourself with the purple hair in a prominent public place. Pros: High trust and low cost. Cons: Unreliable and not scaleable. Owned: Aggregating an audience that seeks you out for content and distribution of your content to that audience. Example: The official “Purple Hair for the Cure” website which would include touching videos of others who raised contributions with purple hair because they had been touched by the disease as well as regular updates on fundraising goals. Visitors could subscribe to get updates in their email. Pros: Low risk and long-term assets. Cons: Slow and not independent. A grey area exists when influencer programs are often compensated. They live in two buckets, earned and paid. PESO gives us an easy checklist to run through to recognize opportunities to expand or introduce new synergies into an existing program. It forces us to look outside of our comfort zone. It also provides a structure or framework for our efforts, making for easy categorization and budget/resource allocation. New times call for a new model to organize our marketing efforts. The PR industry gives us PESO and it’s a great set of lenses we can look through to organize and recognize opportunities, even for “paid” natives. PESO stands for Paid, Earned, Shared and Owned. Each channel has its own pros and cons and each can compensate for the flaws of others. Marketers should adopt this model to help us put some order to our efforts and recognize opportunities to extend our programs into appropriate mediums.